Azure FAQ: How frequently is the clock on my Windows Azure VM synchronized? Q. How often do Windows Azure VMs synchronize their internal clocks to ensure they are keeping accurate time? I can’t find any official stats on how much drift happens generally (though some data is out there), but the question at hand is what to do to minimize it. Specifically, on Windows Azure Virtual Machines (VMs) – including Web Role, Worker Role, and VM Role – how is this handled? So Windows Azure roles use the time service at time.windows.com to keep their local clocks up to snuff. This service uses the venerable Network Time Protocol (NTP), described most recently in RFC 5905. The documentation around NTP indicates it is based on User Datagram Protocol (UDP). While Windows Azure roles do not currently support you building network services that require UDP endpoints (though you can vote up the feature request here! ), the opposite is not true: Windows Azure roles are able to communicate with non-Azure services using UDP, but only within the Azure Data Center. This is how some of the key internet plumbing based on UDP still works, such as the ability to do Domain Name System (DNS) lookups, and – of course – time synchronization via NTP. This may lead to some confusion since UDP support is currently limited, while NTP being already provided. 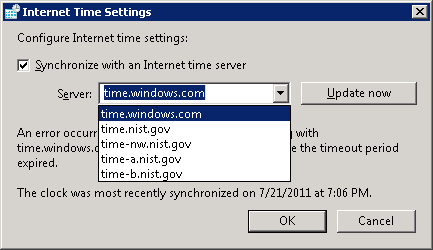 The document cited above mentions you can “choose your preferred time source” if you don’t want to use time.windows.com. 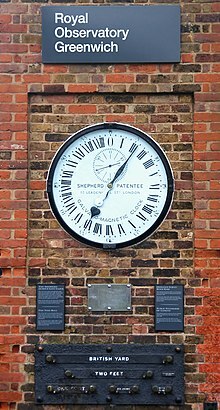 There are other sources from which you can update the time of a computing using NTP, such as free options from National Institute for Standards and Technology (NIST). Interestingly, when I manually tried changing the time on my Azure role using a Remote Desktop session, any time changes I made were immediately corrected whenever I tried to make changes. Not sure if it was doing an automatic NTP correction after any time change, but my guess is something else was going on since the advertised next time it would sync via NTP did not change based on this. 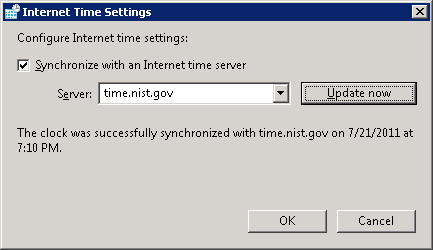 The interesting part of seeing any successful sync with time.nist.gov is that it implies UDP traffic leaving and re-entering the Windows Azure data center. This, in general, is just not allowed – all UDP traffic leaving or entering the data center is blocked (unless you use a VM Role with Windows Azure Connect). To prove this for yourself another way, configure your Azure role VM to use a DNS server which is outside of the Azure data center; all subsequent DNS resolution will fail. If the weekly synchronization frequency is somehow inadequate, you could write a Startup Task to adjust the frequency to, say, daily. This can be done via the Windows Registry (full details here including all the registry settings and some tools, plus there is a very focused summary here giving you just the one registry entry to tweak for most cases). All users should ensure that their software NEVER queries a server more frequently than once every 4 seconds. Systems that exceed this rate will be refused service. In extreme cases, systems that exceed this limit may be considered as attempting a denial-of-service attack. They recommend against using any of the servers, at least at the moment I grabbed these Status values from their web site. I find this amusing since – other than the default time.windows.com – these are the only four servers offered as alternatives in the User Interface of the Control Panel applet. As I mentioned above, sometimes these servers timed out on an on-demand NTP sync request I issued through the applet user interface; this may explain why. And – for the (good kind of) hacker in you – if you want to play around with accessing an NTP service from code, check out this open source C# code. Is this useful? Did I leave out something interesting or get something wrong? Please let me know in the comments! Think other people might be interested? Spread the word! This entry was posted in Azure, Cloud Computing, FAQ and tagged Network Time Protocol, time on August 25, 2011 by Bill Wilder.